Plumbing leaks have the obnoxious qualities of being both very common and very difficult to detect. A lot of the water damage inflicted on homes across the country occurs because small leaks are not detected and fixed in a timely manner. 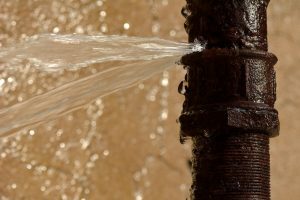 Professional maintenance conducted on an annual basis is a good way to lessen the chances of a leak spending months rotting out the surrounding area undetected. However, you still need to keep an eye out for warning signs that your plumbing system is developing leaks. The following are a few different signs that can indicate that you have leaks forming in your system. Most of the leaks that afflict homes are too small to cause this kind of obvious symptom. These pinhole leaks need to be detected in other ways, as we’ll cover below. However, if you have a moderate or large leak in your home it can certainly manifest by causing your water pressure to drop. If your water pressure is dropping in part or all of your home, it’s likely caused by a serious leak or blockage that needs to be dealt with as quickly as possible. make sure that you call a plumber immediately if you notice that your water pressure is low. One quick way to find out whether or not you have a leak in your home is to turn off all the plumbing appliances and have a look at your water meter. If the meter is still running, then you probably have a leak somewhere in your home. This won’t tell you where the leak is, of course, but at least you’ll be able tell whether or not you should call a professional to take a closer look at the system for you. It’s a good idea to keep an eye on your monthly water bills, and call a professional to take a look at your system if they start to spike beyond what your usage would account for. Large enough leaks, or smaller leaks in large numbers, can waste enough water that it will start to contribute to higher water costs. Make sure that you have your system investigated if you think this is the case, as leaks that severe can cause a lot of water damage. Sometimes, you don’t notice that your system is dealing with leaks until they actually start causing damage to the surrounding areas. You should always be vigilant for signs of water damage in your home, and have a plumber check it out for you if you do happen to find some. If there is water damage visible in an area of your home, then there is a pretty good chance that there’s a leak in that general area that could potentially cause more damage. SPS Mechanical Inc. offers a full range of plumbing services. If you need a top plumber in Sewell, NJ, contact us today for an appointment with one of our experts.